Justin’s note: Catalonia wants independence. As you probably know, Catalonia—the richest region of Spain—held a referendum on October 1. And the people voted overwhelmingly in favor of independence. It’s now likely only a matter of time before Catalonia breaks off from the rest of the country. When that happens, it will have serious ramifications for all of Europe. Justin: Doug, the Catalans want to break off from Spain. Are you surprised by this? Doug: No. But very pleased to hear it. As you know, all of these European nation states were cobbled together from small kingdoms and miscellaneous ethnic groups. They were put together either by force and conquest, or the marriage of some ruler, with no consent of the ruled. National boundaries aren’t part of the cosmic firmament; they’re fluid. Spain is not a natural entity. Neither is France, Italy, Germany, or even Britain, for that matter. People don’t realize it, but up until about 100 years ago the people of Spain mostly spoke mutually unintelligible dialects. The Catalans speak a different language today. The Basques, who are north of the Catalans, are another culturally distinct group with a language that’s totally unrelated to any other in Europe. Spain is a legal fiction that actually just benefits the big shots in Madrid. The people of different regions don’t have all that much in common. And yet, they’ve been put together in a nation state—one of humanity’s more stupid and destructive inventions. So, I expect the devolution of both Spain and Europe to continue. For the first time ever, one of The Agora network’s most successful investment analysts – responsible for giving readers the chance to turn $100,000 invested over 10 years into $480,683 – is publicly revealing what’s in his personal portfolio: deals he’s personally received from his private network of Wall Street contacts, which until now he’s had to keep private, hidden. We’re projecting small stakes in the three companies discussed here could deliver you a windfall. Go here to hear Chris’s details on all of them. Don’t miss this. Justin: Why do you reject the idea of a nation state? Doug: Well, let me first identify my preferences. The optimal situation for the world economy isn’t the more-or-less 225 nation states we have today. It’s about seven billion little nation states. I’d like to see everyone completely independent. The state serves very little useful purpose. Throughout history its main products have been wars, taxes, pogroms, revolutions, persecutions, confiscations, and the like. Politics produces nothing; it’s all about who decides who gets what at whose expense. Political entities are coercive by their nature. The bigger they are, the more dysfunctional. Nation-states are just a testimony to how thoughtless the average person is, that he accedes to the idea, like a sheep. So, seeing Spain break apart is a step in the right direction. But it’s not just where I hope things go—it’s also where things are, in fact, going to go. Even in Europe, with the oldest and most powerful nation-states, you have scores of serious independence movements right now. Hopefully, it will vanquish the silly idea that “unity” is a value, a good thing. That’s as stupid as the idea that its opposite, “diversity” is good. They’re just political notions, neither good nor bad. They’re just tools to influence the emotions of the hoi polloi. Who benefits from the unity of Spain? Certainly not the average Catalan. In Italy, it’s not just the area of Veneto around Venice, and Lombardy around Milan. Sicily, Sardinia, South Tyrol, and Friuli, the area around Trieste, all have secession movements. Before Garibaldi and Victor Emmanuel came on the scene, before unification in 1870, Italy was dozens of little kingdoms and duchies. It could go back to that today. People don’t realize that even the Italian language really didn’t exist not so long ago. “Italian” was scores of dialects. It only started to crystalize with Dante’s Divina Commedia. Northern Italians not only couldn’t understand southern Italians speaking their own versions of Italian, they were different ethnic groups. Even today the northern Italians look down on the southern Italians and call them African Italians. Same thing with Germany. Germany used to be dozens of baronies, dukedoms, principalities and what-have-you before Bismarck. The world would have been better off if it had stayed that way. A united Germany turned out to be a very bad idea. The colors of the map on the wall are always running. They have been since Roman times, and they’ll continue to do so. And the fact of the matter is that, unstable as it is, Europe is among the most stable places in the world. Every single country in Africa, the Middle East, and central Asia is a completely artificial construct where the lines of the map were drawn completely artificially in a boardroom in Europe. National boundaries exist with no attention paid to the ethnicity, religion, language, or the customs of the local people. You’re going to see lots of borders violently readjusted in these places in the years to come. Hopefully, Catalonia will be non-violent. As a wave of violence sweeps America, a reclusive millionaire reveals who’s behind it… and how to protect yourself. 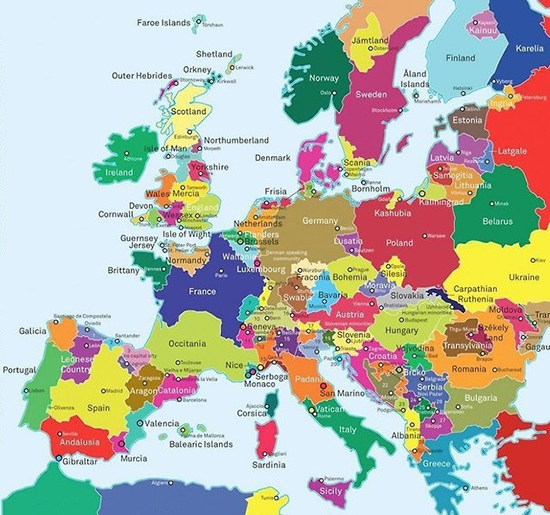 Justin: So, if this is just the beginning, what European country will start to break apart next? Any guesses? Doug: A guess? Belgium, the very homeland of the EU, should be at least two countries, tomorrow morning. It came into being during the Napoleonic era. The Flemish in the north should be in Flanders, and the Walloons in the south should be in Wallonia. They’re linguistically and ethnically quite different. The Basques, both in France and Spain, are an ethnically, linguistically, culturally different group. They should leave. And the Scots would do well to get away from Britain. Generally, it’s the most productive parts of a country that don’t like being exploited by the poorer, non-productive parts. But about Catalonia, it seems the people most opposed to leaving Spain are, surprisingly, the most free-market-oriented types. This is because the Catalan independence politicians are all hard-core socialists and communists. And although it’s a good thing economically for Catalonia to be independent—they now apparently ship two tax dollars to Madrid for every dollar of benefit they get in return—it will be a bit inconvenient in other ways. It will be disastrous if they try to turn it into a socialist people’s republic, because that’s the way these politicians are oriented. Of course, all European politicians are socialists at heart. Most politicians everywhere are. Some populist is always itching to try out his version of social engineering on the public. So, he’s likely to be most pro-independence, in order to become an international big shot. Most of the resistance knows that Catalonia will become much more left-leaning and collectivist if it becomes independent. That’s the case everywhere. There really are no free-market-oriented independence movements, which is the real pity. Most of these places are very nationalistic and socialist-leaning. The dark side of human nature to the fore. But, you know, the first step is to break up large dysfunctional groups into smaller and less dysfunctional ones. Eventually some of them will turn free market just out of necessity. If you had seven billion nation states, none of them would be socialist—you can’t exploit yourself. People might come to realize the state is just a fraud, where everyone tries to live at the expense of everyone else. And let me emphasize that I’m not saying that new states are good in themselves—they’re not. They’re just much better than the status quo. The best outcome would be autonomous regions, controlled by market forces, not political forces. There’s absolutely no good or service that wouldn’t be provided by entrepreneurs. Especially in today’s high-tech world, a state bureaucracy is unnecessary for anything that’s wanted or needed. Justin: What investment implications, if any, do you see coming out of this? Doug: What are the implications indeed? In a chaotic environment, especially where nationalist and socialist ideas are the minds of all these politicians, it doesn’t augur well for the value of property. In other words, if it was a free-market secession movement, asset prices in Catalonia would soar; billions of dollars would try to get into the place. But it’s a nationalist/socialist movement—so billions are going to try to get out. It’s going to hurt the value of local assets. So, this could present an excellent opportunity to pick up companies and real estate in these countries, because fear is going to reign. What are these people going to do once they become independent? Try to become Hong Kong, or try to become Cuba? Maybe there will be a civil war like there was in the 1930s, because Catalonia is the most productive part of Spain, and Madrid doesn’t want to see the revenue go away. Barcelona doesn’t want to be Madrid’s milk cow. Anything is possible in today’s world. Justin: What about the euro, the currency of Spain and the rest of the European Union (EU)? Doug: Well, the euro has been a dead man walking since the day it was created. It can only be described as an Esperanto currency. It can’t possibly hold together. You can’t have a currency that’s unbacked by anything, but used by countries with vastly differing economies, welfare traditions, and so forth. The stronger secessionist movements become, the weaker the euro will become. The Euro is a dead duck; it will turn into wallpaper, like hundreds of paper currencies before it. These countries are going to go back to their individual currencies. Actually, you’re going to see gold once again used as a day-to-day currency. It will be facilitated in that role by the cryptocurrency revolution. People forget that during the 19th century—which was the most stable, prosperous, peaceful century in human history—the lira, the frank, the mark, the pound, and the ruble were all just names for certain amounts of gold. All of these countries issued small gold coins and they were completely interchangeable across borders. So, hopefully we’ll go back to that. Justin: That’s yet another reason to own gold. Anyway, that’s everything I wanted to ask you today. So, once again, thank you for sharing your insights. Justin’s note: Doug will be speaking at the New Orleans Investment Conference, October 25–28. This conference is one of the top gatherings of private investors and attracts wealthy individuals from all 50 states and over 35 nations. It’s where some of the world’s most sophisticated investors gather to discover new opportunities and strategies, exchange ideas, plan for the coming year, and enjoy the camaraderie of like-minded individuals in a fascinating and entertaining city. This year, there will also be a special event for Casey Research subscribers that you won’t want to miss. For more details and how you can join, click here. Be sure to use the code FREEGOLDCLUB to get free Gold Club access ($189 value).